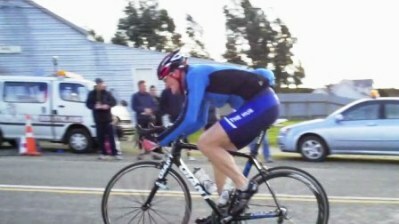 The first handicapped road race of the winter season covered 3 laps of the 27km Woodstock circuit in the Mabel Bush area. With the Southland Juniors away at a training camp in Heriot and other notably riders missing, a field of 48 started the race in cool breezy conditions. With five bunches in total the front markers had a 25 minute start on the scratch bunch. Going through the start/finish line after lap one all the bunches remained intact and were working well together. Most notable progress was being made by the scratch bunch who had closed in nearly half of the 6 minutes gap on the group in front and made up 9 minutes on the front markers. During the second lap the second and third groups came together. The increased number of riders helped to keep the pace steady on the gusty exposed roads with a fast charging scratch and break bunch in pursuit. Lap two saw the distance and conditions beginning to take there toll as many riders began to struggle and getting dropped from their groups and withdrawing. 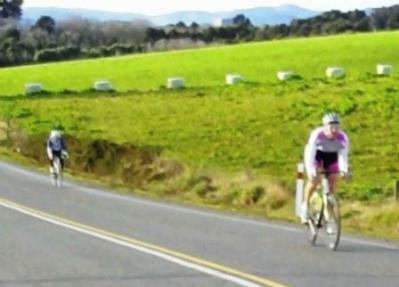 On completion of the second lap the front makers maintained a slim 1 minute advantage over the next larger group. The back markers were still progressing well and were now only 7 minutes from the front and had almost caught the equally strong looking break bunch. Going into the final lap it looked odds on that a combined scratch and break group would easily get to the front of the race to contest the major placings. Lap three effectively became a race between two large groups of riders with the three front groups having combined and the scratch/break group chasing them down. However once the scratch and break bunches combined all momentum was lost and they did not work well together which gave any strong riders from the front group a slim chance of victory. The closing stages of the course featured a number of small hills which after 80km's of racing was enough to split up the front group of riders. Strongest of them was Kylie Young and Tony Raggett who managed to gap the rest with Kylie comfortably taking first place honors. In third and fourth places 20 seconds later Tim Maynard and Michael Matheson also managed to hold out the fast finishing scratch riders who had only caught the rest of the front markers in the finishing straight. Garth Cooper and Jerard Stock managed to slip away from the rest of the scratch bunch with Garth taking fastest time and 6th place overall. Virtually everyone else in the race came in together 1min 8 seconds behind the winner. The cool conditions and a step up in distance brought out the best in many riders with a lot indicating they dug deep into the red zone. Despite whatever happened this was good preparation for this weekend's 100km Memorial Classic race. Above: Garth Cooper streaks to the line to claim fastest time in the Mabel Bush Handicap.